Chestnut Grove can refer to the park/campground that was bounded by Leidheiser’s Farm to the east and Cowles Creek to the west, or to the small park east of The Lodge and Conference Center, which is built on the former’s property. Located at the west end of The Strip, between Leidheiser’s and Cowles Creek, Chesnut Grove was, in general reference, a tract of land that was first used as a campgrounds and later as a campgrounds and cottage development, with about 120 cottages. The earliest record of this area being used for recreation is the late 1840s, when boats were being offered for use on Cowles Creek and a picnic grounds was provided. Chestnut Grove, said to be so named because of the chestnut trees that grew here, appears to have developed independent of The Strip or the commercial district to the east. The grove, throughout its history, appealed to those who preferred roughing it to being pampered by one of the inns or hotels in the resort town. Prior to being named Chestnut Grove, the area was (probably more appropriately) known as The Marsh. Cowles Creek formed an estuary at Lake Erie, and the water backed up onto the lowland some distance whenever a sandbar formed and prevented the creek to discharge into the lake. This marsh was destroyed when the state built a parking lot large enough for 2,000 vehicles on the wetlands. The parking lot was both an environmental and common sense disaster. 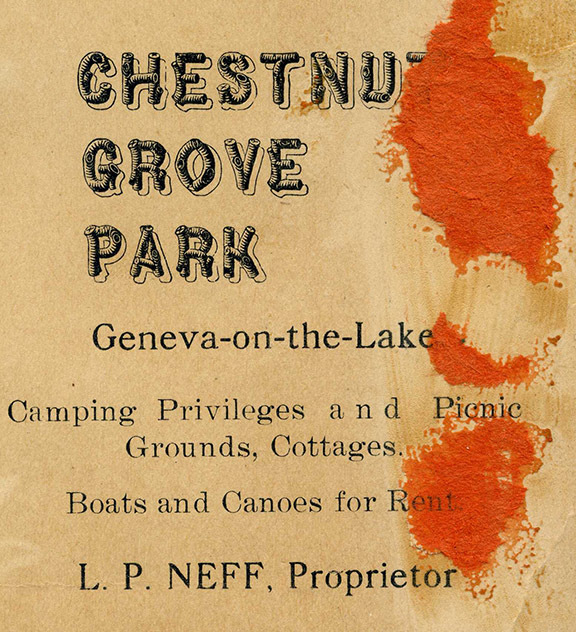 Chestnut Grove, a more endearing and marketable title, was covered with a thick forest when the European settlers first came to what became Geneva Township. In addition to hardwoods like Chestnut, there were oak, poplar, maple and walnut trees on this land, trees well worth the trouble and effort of falling them. Once the valuable timber was harvested, settlers began the arduous work of converting the land to farm use. But the marshy area around the estuary seemed destined for other purposes. In 1884 the land was purchased by the Munger/Gregory investors, who were instrumental in developing GOTL as a resort. But the opportunity to sell the property to industry came in 1908 when Jones Laughlin Steel Corporation bought up the land along Cowles Creek in anticipation of a canal being built between Lake Erie and the Ohio River. It appears that Jones Laughlin hired a manager for the park during its ownership so there would be some revenue from the investment. 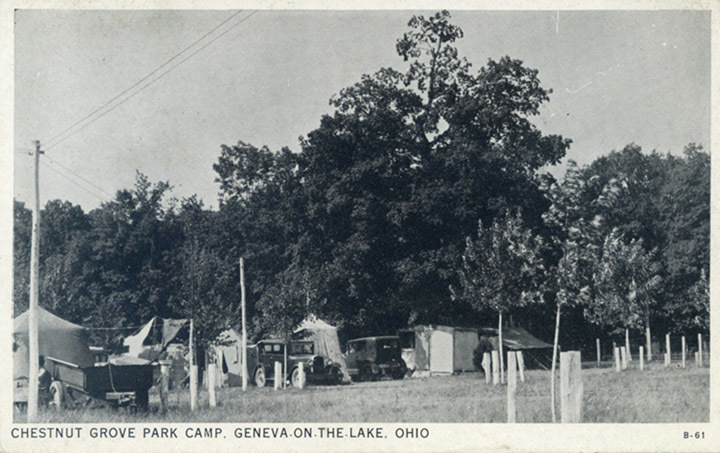 An article written by Eva Moore (Ferry) Kerzic and published in the 1976 “History of Ashtabula County, Ohio,” states that Casper and Mary McCorkle and their son Harlan managed the park in 1918. Kerzic, who wrote from the perspective of a former camper, stated that there was a bathhouse, general store, cottages and campsite rentals. “Most of the cottages were of one or two room wooden buildings with only shelves for dishes, pots and pans, and a tw0-burner oil stove. A screened porch served as the living room. Communal out houses in the middle of the park served everyone,” she wrote. The general store and bathhouse stood about 100 feet inland from the lake. There was an ice house and a boathouse on the bank of Cowles Creek. Ice was cut from the lake and creek in the winter and stored in sawdust. Vacationers made good customers for the ice in the summer months. In the early 1920s, L.P. Neff leased the park from the steel company for 99 years. Neff later sold the lease to Louis Kopp and sons. Kopp owned and operated the park until 1964, when they were forced to sell out for the new state park. While The Strip developed as a playground for the upper-middle class from Cleveland, the Grove was a rustic getaway for the working class from Western Pennsylvania and Youngstown. Camping spots or cottages would be rented for the entire summer by a family. They would arrive as soon as school was out and set up shop in their rough-built cottage. The father would return home to work at the mill during the week and come back to GOTL every weekend. The mothers tended to their youngsters, went to the beach, played cards with the other ladies and tended house while the youngsters swam and, if they were fortunate enough, went into town to enjoy the amusements, most of which cost money. But, in general, there was little interaction between the “Grovers” and those on The Strip, and youngsters who grew up in the village were warned not to play with Grovers or enter their territory. There were work opportunities within the Grove, so those youngsters who wanted to earn extra money could do so by buying donuts at Madsen and re-selling them to campers, delivering newspapers, cleaning the campgrounds and working in the general store. The memorable campers, there were an estimated 1,200 of them in a typical summer, included the family of a proctologist, who stayed in a Greyhound bus that had been converted into living space. The beach is often cited as the Grove’s greatest amenity. Bathers could rent a bathing suit at the general store. The estuary created a wide beach, while the creek provided boating and fishing opportunities. The Lodge and Conference Center occupies much of what was Chestnut Grove. Its ties to the hospitality industry go back to the 1840s, when C.R. Castle advertised pleasure boat rides from the marsh. In 1884, the Mungers purchased the land. They sold the land to Jones Laughlin Steel Corporation in 1908. Rufus Hoskins, who owned Maple Manor and was the father of Clarence Hoskins, leased Chestnut Grove for a while. Advertising from the grove’s ball park score card. Did you camp at Chestnut Grove as a child? Do you have photos or memorabilia of this special place? Please share them through the comment form or, to send photos, send an email.